Golden Gate Audubon Society and California Academy of Sciences are very excited to offer our Master Birding Program in 2019 for the sixth year. The objective of the course is to help up to 20 ambitious students enhance their birding and conservation skills, and to develop 20 new active conservation community members for GGAS, The Academy, and other Bay Area institutions. The Master Birding Program is an advanced class, and is one full year in duration. We will have 11 classes and 11 field trips spread throughout 2019. Classroom meetings will take place at The Academy to take advantage of The Academy’s collections and facilities. Field trips are designed to reinforce class subject matter and to get firsthand experience with the breadth of birds that occur in the Bay Area. Prior to taking the course, prospective students are expected to be able to identify California birds at an “intermediate level” (100+ species by sight, and 25+ species by sound). To successfully complete the program, students must complete at least 100 hours of volunteer service with a MB designated organization (GGAS, The Academy, and a long list of other Bay Area birding or conservation organizations) over a two-year period, and participate in at least 70% of the classes and field trips, and learn a variety of other skills. Upon completion of the program, graduates will have developed a field notebook documenting sightings of over 200 bird species, will know how to identify some of the more difficult local bird species, will learn about avian physiology, behavior, taxonomy and other topics, and will develop an understanding of avian habitats and bird communities. Successful graduates will have participated in over 20 organized field trips, developed a backyard (local patch) list, and will have made a 10-minute presentation to the class on an avian topic of their choosing. Click here for additional information about course curriculum and requirements. Instructors are Jack Dumbacher, Eddie Bartley and Bob Lewis. Fee for the class is $700, but members of the California Academy of Sciences or the Golden Gate Audubon Society will pay a discounted rate of $600. The class will start Wednesday February 13th, 2019, and will be held on the second Wednesday of each month, 6:30 – 9:00 PM, with a couple of exceptions. The class will finish in December 2019. Field trips will typically be on the weekend immediately following each class. Not Wimpy! 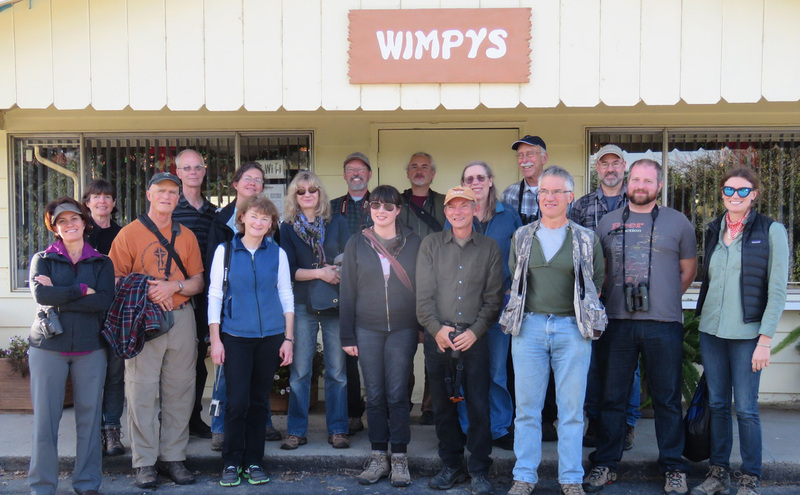 Our 2014 Master Birding cohort at our final day trip to Cosumnes River Preserve near Sacramento. We've just been well fed, and we're headed back out to see Sandhill Cranes, geese, and other migratory waterfowl and over-wintering birds in California's Central Valley.